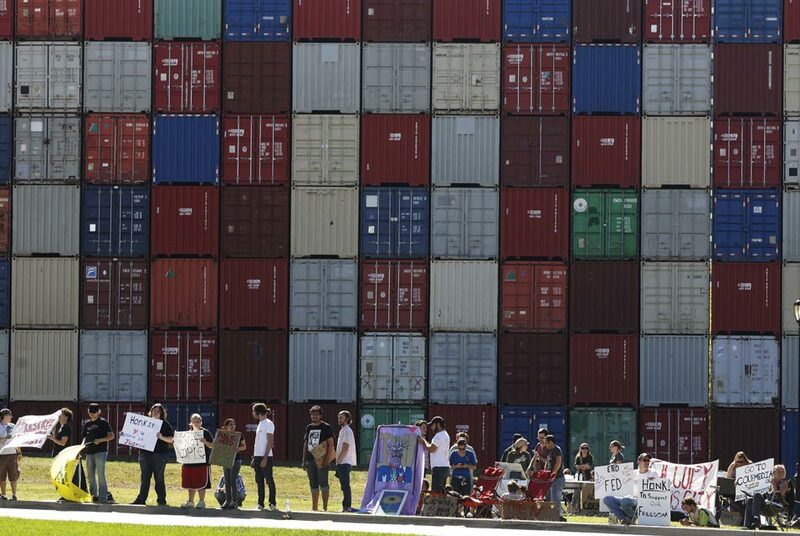 Demonstrators stand in front of the letters "IOU" spelled out on shipping containers across the street from the Federal Reserve Bank of Kansas City in Memorial Hill Park in Kansas City, Mo. The piece, designed by artist John Salvest, is almost seven stories tall and is comprised of 105 shipping containers. AP Photo/Orlin Wagner. KANSAS CITY (AP).- Across the street from the Federal Reserve Bank of Kansas City, a foreboding tower of shipping containers glowers at the building spelling out an in-your-face message: "IOU." On the other side: "USA." The 65-foot-high structure by artist John Salvest is made up of 117 carefully-aligned cargo and storage containers  the kind that ply the world's rivers and oceans carrying everything from Hyundais to Happy Meal toys. The piece is creating a buzz in Kansas City as debate about the national deficit surfaces as a key theme of the upcoming presidential race and budget shortfalls are the top concern in the nation's statehouses. The artist behind it says the message is open to interpretation. But the symbolism of shipping containers stacked tall in the shadow of the city's Federal Reserve building can be taken as a slap at a government groping for ways out of its debts. "Obviously the inspiration was the national debt problem," Salvest said in a telephone interview from his home in Jonesboro, Ark., where he teaches at Arkansas State University. "But that trickles down into a lot of peoples' lives, and I think a lot of people are frustrated or angry or worried about their economic well-being." He added: "Some people are offended by it. One woman said 'I feel it's nothing but a big waste of money.' Some have sent me really sweet emails about how it really moved them." Since the piece went up earlier this month there have been more than 50 visitors a day, said Stacy Switzer, artistic director of Grand Arts, the nonprofit Kansas City gallery and sculpture studio that funded the project. "We've gotten everything from 'When is that ugly thing coming down?' to people coming out of the Fed's Money Museum saying they may not like the looks of it, but they understand it," Switzer said. Switzer would not say how much the project cost. But she said with renting the containers, hiring a crane to put them in place, paying for round-the-clock security to make sure no one climbs the structure or tags it with graffiti, it is "definitely one of our biggest projects." The "IOU" side faces the Federal Reserve's new building and is fully visible to employees from windows looking directly out on to the park. Bill Medley, spokesman for the Kansas City Fed, says the bank is not commenting. Salvest described an installation process that required NASA launch-like precision to line up the containers and bomb-sniffing dogs sent over by the Kansas City Fed to ensure the containers were safe. So far, the piece has generated discussion, but no incidents. Michael Mikkelsen, 29, of Kansas City, was among fans of the piece. Mikkelsen was taking part in a protest against the Federal Reserve at the site Friday and said he was excited when he heard that the IOU/USA piece was coming to Kansas City. "The artwork's awesome," Mikkelsen said. "I think it helps people to like look into the Fed more and understand what they're doing. The way the Fed creates money, they're creating money out of debt instead of having sound money where they're encouraging savings." The work, which comes down in mid-October, goes beyond the "anger and rhetoric circulating out there and makes us think about what it means to be in our economic situation," said Jan Schall, curator of modern and contemporary art at the Nelson-Atkins Museum of Art in Kansas City. "It's a very complex work," she said. "To me with one sculptural, monumental-sized installation piece a whole flood of ideas is released for our consideration."